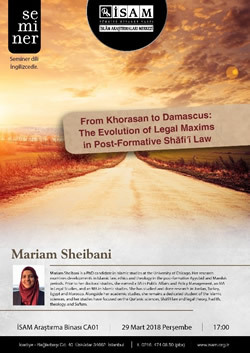 Mariam Sheibani is a PhD candidate in Islamic studies at the University of Chicago. Her research examines developments in Islamic law, ethics and theology in the post-formative Ayyubid and Mamluk periods. Prior to her doctoral studies, she earned a BA in Public Affairs and Policy Management, an MA in Legal Studies, and an MA in Islamic studies. She has studied and done research in Jordan, Turkey, Egypt and Morocco. Alongside her academic studies, she remains a dedicated student of the Islamic sciences, and her studies have focused on the Qur'anic sciences, Shāfiʿī law and legal theory, hadith, theology, and Sufism..